These people are the moderators who are responsible for rules in-game, in the chat, and in the forum. They're also very willing to help you with anything, so if you have questions you can PM (private message) them. You can identify the mods by their white names, they can also be found at the top of the user list or by using !mods command to be given a list of online moderators. If you are interested in joining the moderator team you can write a PM (private message) on the forums to the "IRC Moderators" group as shown here detailing on why you think you would make a good addition to the team, which timezone you live in and what sort of commitment you are able to make if you are selected. Important: QAI and AeonCommander are chat bots! This is the updated list of Trainers. These people are trainers who can teach you how to play Supreme Commander. PM them in FAF chat and ask for a lesson! To track down their name change, go here. List of trainers happy to help you! [BC] biass  AUS English GMT+10 Training for <1500 rated players, specializing in 1v1. [SC] Endranii  POL English/Polish GMT+1 Training for 1000-1500 rated players, specializing in Seton's gameplay. [GB] F-Odin UK English GMT Training for <1500 rated players, specializing in teamgames. [PLD] Inspektor_Kot RU Russian GMT+3 Training for <1600 rated players, specializing in 1v1. [BAW] OxideIon FIN English/Finnish GMT+2 Training for 1000+ rated players, specializing in 1v1. [RA] PARALON RU Russian/English(chat) GMT+3 Training for <1500 rated players. [SNF] EcoGuyNoob AUS English GMT+10 Training for 1500+ rated players, specializing in 1v1. Uteten  GER English/German GMT+1 Training for 1000-1500 rated players, specializing in 1v1. 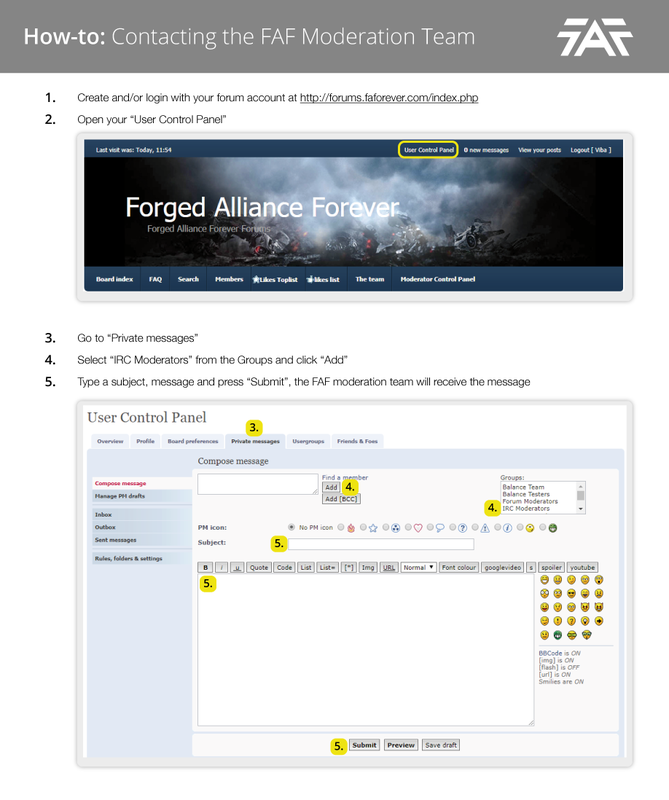 Forged Alliance Forever (FAF) is a community project of players and contributors who want to sustain and advance the game Supreme Commander: Forged Alliance. The Council of Setons is a group of FAF contributors selected and tasked with the responsibility to guide the FAF community project. All Councillors make a symbolic pledge to mark the assumption of their important duties for FAF. I will spend at least 4 hours per week working on These Responsibilities. I will be available at least 2 hours every other week for a voice call to discuss these Responsibilities and the responsibilities of other FAF Councilors. I will use and be available on the FAF Slack (chat) as much as possible. I will do my best to help the other Councilors perform their responsibilities. I understand that if I am unable to perform these duties, I will resign or be replaced. I will be as active as possible to dedicate to the responsibility of this role. I will attend as many developer conferences as possible to discuss all topics related to the FAF council. I will advertise all new content that FAF provides using all available social media platforms. I will deal with any complaints related to the promotional role with professionalism. I will offer as much help as possible to the council and councillors. I understand that if I am unable to perform accordingly, I will be replaced. I will handle all translations for the FAF announcements. Communicate with as many FAF players as is possible to gather, represent, and promote their ideas and interests. Organize a schedule of the FAF community project events. Organize tournament directors who run tournaments for players. Gather feedback from the FAF project community to determine their top desires and problems. Present and represent this information in the best interests of the players to the Council of Setons. This is a list of people who host Tournaments on FAF. If you want to become one of them you can sign up by joining the PC Discord and do not forget to read these rules. This page was last modified on 22 December 2018, at 13:07.